Do you why your clients stay with you? Do you know why client love world’s top salon? Do you know in which aspects of salon you are doing well? 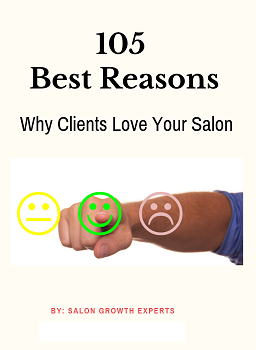 This eBook provides 105 best reasons why client loves your salon. What this eBook is all about? Client retention is more important than client acquisition, especially for salon business. Research shows it costs six or seven times more to get a new client than retain existing ones. 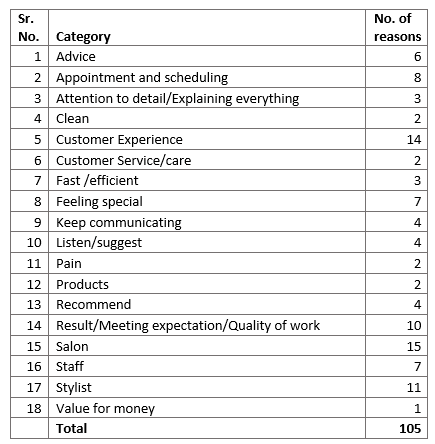 This eBook mentioned 105 reasons why client loves your salon across 18 categories. It an amazing way to learn what other best salon across the world are doing well so you can learn and adapt. You can go through this eBook individually but it’s more beneficial if you can do this exercise with your team. In this eBook 105 possible ways, you could retain client have been mentioned in the 18 categories. As you can see in each category, there is a number of reasons. Compile the findings. Now pick reasons which you have mentioned “Always” as that reason could be the biggest reason why you may be retaining a client. Capitalise and strengthen it. Go through Often and Sometimes reason as well and try to strengthen where possible. Never and Rarely may be the area where you should strengthen. Repeat this exercise every quarter with your team. You can always get the print out of this eBook and do the exercise. Alternatively, you can use our ready-made online software to go through this exercise. It would more effective and efficient to do in the software especially when multiple people want to do this exercise. You can also add/update/delete categories and criteria to suit your needs. Send an email to hitesh@getgrowthexperts.coms, if you want to find out more about software.